We enjoyed a wonderful week in Valparai in December 2010, thanks to all the information kindly provided by several of our India Mikers. A very big thanks to all of you. Valparai is a small town in Coimbatore District. It is surrounded by tea estates, on a plateau at approx.1200m in the Anamalai range of the Western Ghats. Accessible by road from Pollachi via the Aliyar Dam through 40 scenic hairpin bends in the Anamalai mountains of the Indira Gandhi Wild Life Sanctuary . Look out for Nilgiri Tahr at the 9th Hairpin Bend [Loam’s View Point] and for Lion Tailed Macaques and Bisons beyond Iyerpadi. Accessible by road from Chalakudy in Kerala via the Athirapally and Vazachal Falls and the Upper Sholayar Dam. Look out for wildlife in the Sholayar jungles. Public buses ply from Chalakudy to Valparai, taxis also available –interstate permit charge will apply. Also accessible from Munnar via Udumalpet and Pollachi. Frequent public buses ply in all directions to the various estates, from the Gandhi bus stand on the one and only main road. This is a cheap and easy way to travel, giving unmatched views if you sit in the front seats. Autos and taxis also easily available, at negotiable rates. A beautiful lake surrounded by high mountains and dense forest, on the foothills of the Pollachi - Valparai ghat road. Shortly after the Aliyar Lake, just off the Aliyar Valparai road. Keep your foodstuff out of sight of the waiting monkeys. Kadamparai Dam – turn off from the Aliyar - Iyerpadi road. Permission required. Puthuthottam Falls – Small waterfall and stream, 4km before Valparai, visible from the main Pollachi Valparai road. Lion Tailed Macaques can be seen here. Nirayar / Nirar Dam - turn off from the Cinchona Chinakallar road. Approx. 15km from Valparai. Chinnakallar Falls – Gushing small falls and rapids, about 18km from Valparai, beyond Cinchona and near the Nirar Dam. Serene, emerald blue lake 20 km from Valparai town, adjoining the Malakapara tea estate. The Manamboly forest is in the vicinity. The Kerala border lies just beyond the dam. In Karamalai, within the Peria Karamalai tea estate. Road goes from Iyerpadi, or from Valparai town on the Akkamalai road. Nallamudi Poonjolai and Number Parai: In the direction of High Forest Estate, these are view points overlooking a deep valley and the Anaimudi Peak of Kerala. Clear weather required to see Anaimudi. On a clear day, these grass topped mountains ranging from 1600m to 2300m high, are visible in the distance from most places in Valparai. Easily accessible from Akkamalai and Iyerpadi. Permission from the Forest Dept. required to visit, but tea workers in adjoining estates can be persuaded to take you there through short cuts. Small waterfalls, gushing rapids and little streams are found in all the tea and coffee estates surrounding Valparai. Walking through the well maintained public roads and estate pathways is an easy way to discover and enjoy these sylvan surroundings. Some estates are fringed by forests. Consequently, wildlife like elephants, bisons, lion tailed monkeys, great hornbills, bears etc. are frequently sighted. The Anamalai Nature Information Centre located on the main Aliyar - Valparai road at Iyerpadi, provides information about nature and wildlife, organizes treks etc. Open daily between 10am and 5pm. Top Slip / Parambikulam for wild life safaris. Athirapally and Vazhachal Falls. Expect to find them everywhere, not just in forests. The local plantation workers use an effective concoction made by crushing tobacco leaves in gingelly oil. A salt solution is as effective. Your hotel / home stay. Several restaurants and messes along the main road, all serve freshly cooked, tasty and wholesome Tamil Nadu and Kerala style veg. and non-veg. meals and tiffin, along with their version of Chinese. Bakeries and tea houses abound, serving freshly baked savouries, cakes etc. We enjoyed our fare at the Plaza Hotel and at MKS Bakeries, the food at Green Hills was also good. I did not see any “bhavan” type pure vegetarian establishment so those who refuse to eat vegetarian food from a non-veg. establishment, may have a problem. I dont know how some of the pics have come large and some as thumbnails. These are from travelpod which doesnt seem to have the same sizing system that Flickr does. If it is a problem and anyone wants to remove the large size, please go ahead. Nice detailed report and Great Pics. Yes would have preferred them all the same size: Big. :D i just stay @ my brothers place , in a nice bunglow on a tea estate overlooking the backwaters & the mountain . I am planning for a Pongal getaway , lucky me [happy]. BTW : A nice nice place with almost no tourists !! Lucky you indeed, Nomad T.
The hotel info is for lesser mortals who do not have relatives with tea bungalows there! By the way, if you get to know through your brother of any lower priced tea bungalows for vacation stay, do post the details here. Great detailed report, it looks lovely....maybe this is where we should head to next? Thanks for sharing. Your trip report has given me some pointers as to what I missed in my visit to Valparai in September 2010. Most of us make visits to these places as tourists but you have been visiting such places as an explorer. So I would call this trip report as Valparai Exploration Report :). I thought you would have visited Grass Hills but as you said in the report, you had better opportunity to visit grass hills in Nilgiris. From pictures I saw here and elsewhere, I got an impression that Valparai Grass Hills looked like bugyals in Garhwal Himalayas. 2 weeks i will post about nice home-stays in valparai . And yes , i do consider i am lucky . This lesser mortal also is looking for hotels near " aane mudi "
A must visit place . Sadanand, I read your Valparai report at least four times before we went there and I made my hubby read it too. In fact, even though we always had the vague intention of going there, it was only after reading your report that the intent crystallised into a concrete trip! I was looking forward to seeing those baby tahrs like in your pictures, though we did not see any tahrs in Valparai. Saw some tahrs at Avalanche later. About Himalayan bugyals, you will know better. I have only seen Himalayan meadows on the ridge above the Jalori Pass, on the Hatu Peak, and around Narkanda. These were more like Alpine type meadows, of the type found at Avalanche by the lakeshore and at the Wenlock Downs of Ooty. The shola - grassland mountains of the Nilgiris / Anamalais are a different type of grass - more tufty, tough grass with those small white plants that Nilgiri tahr love to eat, I dont know the name of the plant but it shines luminiscent like in the evenings. 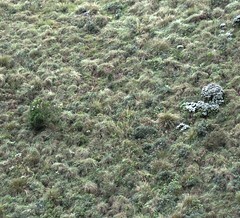 The Todas use this grass to make their traditional houses. I have some photos somewhere which I will post when I find them. The shiny white shrub is of asteraceae family, Gnaphalium something or the other, and the clumpy tufts of grass are what is used by the Todas. I have no idea if this is the same grassland type of the Himalayas. You are correct. 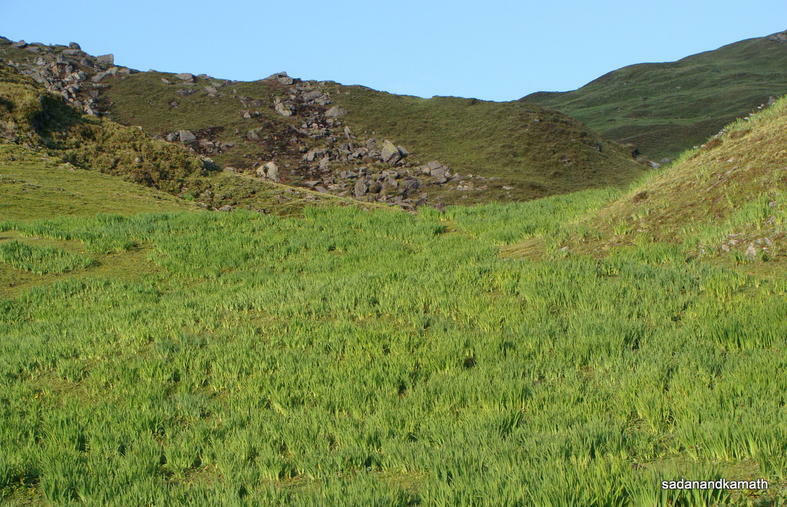 The type of grass shown in your picture does not match with the grass of Gorson Bugyal (3380m). See the picture below taken in June'10. They look a bit like some bulbous plant but I cant be sure. 3380m, my God that is high! This was a wonderful write-up and pictures. I grew up in Coimbatore, and like many of the things that were around you when you grew up, I've never paid any attention to Valparai and the Anamalai Hills and their - obvious from this page - many treasures! I will send on this link to my Dad who still lives in Coimbatore, I am sure he will appreciate it too! Coimbatore is surrounded by so many easily accessible places of beauty. You are right about locals not bothering about what is theirs for the asking. I went to Elephanta Island a couple of years ago, and that was after a gap of decades! Lonavala? I think I last went there as opposed to driving through, maybe 30 years ago. So you are back with yet another wonderful travelogue :) Loved the shot of grass hills and the LTMs. Planning to catch up with valparai again sometime (by public transport). Would like to know if permission is required from the forest officials to visit grass hills. And what about the puthuthottam estate and other private estates, where I hear one could come across bisons and varied species of birds - do we require prior permission from the authorities/owners?